**Event will only be pushed if high winds, lightning or hail is predicted on the 27th. If you register, you will be receive communications. Friends of Long Hunter State Park (FLHSP)is in phase two of the Jones Mill trail expansion and with that brings new areas around the lake that need cleared of years of trash accumulation. 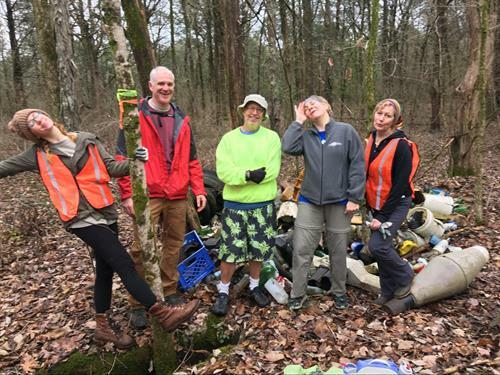 We have long been preparing for this day by pulling in some of the scattered trash and tires from previous floods into piles near the new trail. Recent flooding has lifted more trash to the surface for us. Please help us meet at least the 100 person goal for this day and register at the link below to help remove all trash. You will find more detailed directions in registration. It’s ok of you can only stay for some of the day - go ahead and register to stay in the loop of communications. Many hands makes light work. We know kids love to help! They are welcome if accompanied by parent. Use your judgement if this event is appropriate - per child - if they are able to participate lightly supervised. Also consider the handling of broken glass occasionally. The day will start at 8AM and end at 1PM. Please bring your own reusable containers for water and coffee. We will provide the water, coffee, snacks/fruit, sunscreen, bug spray to begin the day. We will have all equipment to aid in remove the garbage and tires. We will be covering approximately two to four miles total of off-trail terrain which is somewhat flat but rocky in areas.Wear sturdy shoes and weather appropriate clothes, bring reusable beverage containers. Hats help you dodge branches. Near to 12:30pm we will provide you with a nice lunch and a t-shirt to commemorate your generous time/efforts and THANK YOU for participating in Earth Month at Long Hunter State Park!